1) 池谷仙之・阿部勝巳(著) 太古の海の記憶　オストラコーダの自然史. 東京大学出版会 東京. 2) 岩槻邦男・馬渡峻輔(編) 生物の種多様性　バイオディバーシティーシリーズ1. 裳華房. 東京. 3) 片倉晴雄・馬渡峻輔(編) 動物の多様性　シリーズ21世紀の動物科学2. 培風館. 東京. 4) 池谷仙之・棚部一成(編) 古生物の生活史　古生物の科学3. 朝倉書店. 東京. 5) 瀬戸口烈司・小沢智生・速水　格(編) 古生物の進化　古生物の科学4. 朝倉書店. 東京. 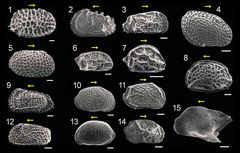 Ikeya N, Tanaka G, Tsukagoshi A (2003) The database of Japanese fossil type　specimens described during the 20th Century (Ostracoda). Pp. 37-131. In: Ikeya N, Hirano H, Ogasawara K (Eds) The database of Japanese fossil type specimens described during the 20th Century (Part 3), Palaeontological Society of Japan (Special Papers 41), Tokyo. 伊藤立則 (1985) 砂の隙間の生き物たち. 241p., 海鳴社. 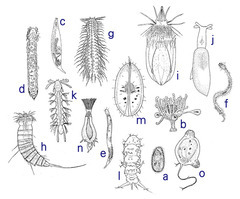 Higashi R, Tsukagoshi A (2008) Two new species of Microloxoconcha (Crustacea: Ostracoda: Podocopida) from Japan, with a redescription of the genus. Species Diversity 13: 157-173. Hiruta S (1983) A new species of the genus Polycope Sars from the Inland Sea of Japan (Ostracoda: Cladocopina). Proceedings of the Japanese Society of Systematic Zoology 26: 1-10. Hiruta S (1989) A new species of marine interstitial Ostracoda of the genus Microloxoconcha Hartmann from Hokkaido, Japan. The Proceedings of the Japanese Society of Systematic Zoology 39: 29-36. Hiruta S (1991) A new species of marine interstitial Ostracoda of the genus Psammocythere Klie from Hokkaido, Japan. Zoological Science 8: 113-120. 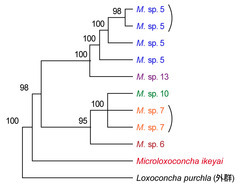 Horne DJ, Cohen A, Martens K (2002) Taxonomy, morphology and biology of Quaternary and living Ostracoda. Pp. 5-36. 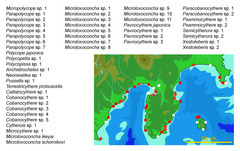 In: Holmes JA, Chivas AR (Eds) The Ostracoda -Application in Quaternary Research. American Geophysical Union (Geophysical Monograph 131), Washington, DC. Kaji T,Tsukagoshi A. (2010). 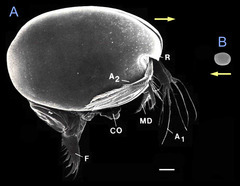 Heterochrony and modularity in the degeneration of maxillopodan nauplius eyes. Biological Journal of the Linnean Society 99: 521-529. 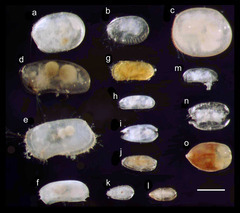 Tsukagoshi A (1988) Reproductive character displacement in the ostracod genus Cythere. Journal of Crustacean Biology 8: 563-575. 塚越　哲 (2004) 種多様性研究と古生物学: 間隙性貝形虫類を例として。化石 75: 18-23. 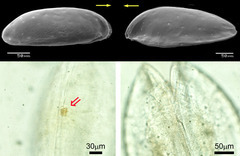 Schornikov EI (1975) Ostracod fauna of the intertidal zone in the vicinity of the Seto Marine Biological Laboratory. 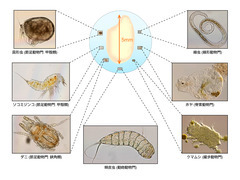 Publications of the Seto Marine Biological Laboratory 22: 1-30. Ward JV, Malard F, Stanford JA, Gonser T (2000) Interstitial aquatic fauna of shallow unconsolidated sediments, particularly hyporheic biotopes. Pp. 41-58. In: Wilkens, H., Culver, D. C. and Humphreys, W. F. (Eds) Subterranean Ecosystems. Elsevier, Amsterdam. 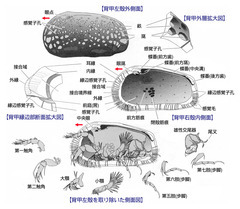 Watanabe S, Tsukagoshi A, Higashi R (2008) Taxonomy and ecology of two new interstitial Ostracoda (Podocopida: Cytheroidea) from Shimoda, central Japan. Species Diversity 13: 53-71.